Posted on Tue, Jan 3, 2012 : 5:57 a.m. The owners of Ellie's Chelsea have just purchased the Gourmet Chocolate Café next door in the Clocktower Commons in Chelsea. Two of the world’s most beloved foods—cheeseburgers and chocolates—are now available in one sweet-smelling storefront. 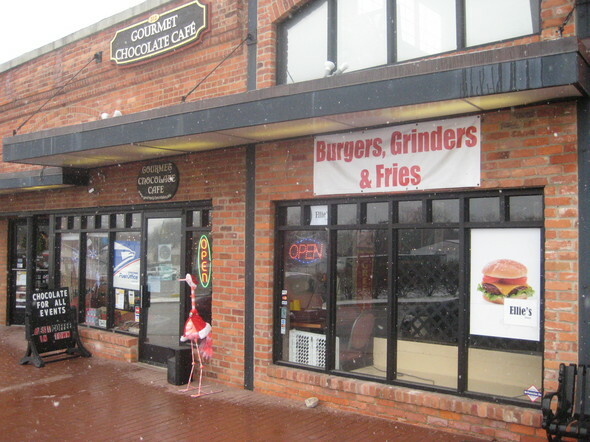 The owners of Ellie’s Chelsea, a burger and sandwich shop located at 312 N. Main in the Clocktower Commons in Chelsea, have just purchased the Gourmet Chocolate Café next door. “The couple who opened the chocolate café has a growing young family and they retired from the business to take care of their four kids,” said Steve Radant, who owns Ellie’s with his brother Mike and mother Judy. The Radants’ friendship with former chocolate café owners Tom and Tina Diab goes way back. Judy — who has been catering and baking in Chelsea for 40 years — knew Tom from her days teaching culinary arts through the Washtenaw County vocational program. He encouraged them to open their restaurant in the space adjacent to them in December 2010. 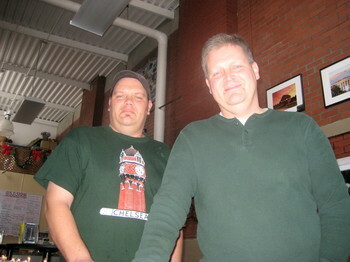 Mike Radant, left, and Steve Radant stand on the Ellie's Chelsea side of their business. The brothers are in business with their mother, Judy. Everything at the chocolate café will stay the same, from the staff to the phone number. The only change at this point is that the Radants will now open at 7 a.m. every day to serve grab-and-go breakfast items. This includes Judy’s homemade cinnamon rolls, muffins and bread, as well as coffee from Ann Arbor-based RoosRoast Coffee. Steve says business has been good for Ellie’s since opening last year. Lunch is their busiest time, when they serve workers from the nearby Jiffy Mix, Teddy Bear Factory and Chelsea Hospital medical offices, as well as do takeout and delivery with local shops. They are known for their burgers and oven-baked grinders made with locally produced fresh ground beef on a homemade roll, along with Judy’s daily homemade soups. Dinner specials during the week, such as their slow-roasted ribs on Wednesday nights, also are gaining attention from regulars. 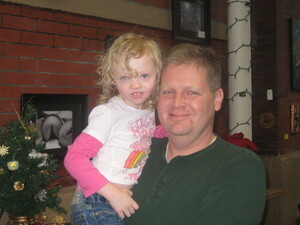 Steve Radant holds Mike's daughter, 4-year-old Ellie, for whom the restaurant is named. A family-run food business is nothing new to the Radant family. Their maternal grandmother, Bernice Miller, opened the first coffee and doughnut shop in Chelsea, The Village Bakery, in 1974. 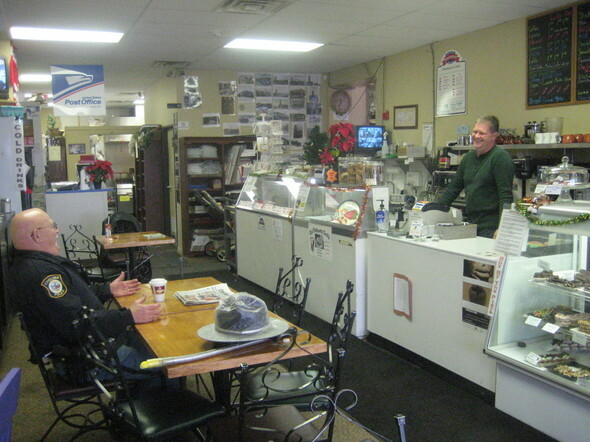 Still operating, the bakery has changed hands several times over the years and is now called Pierce’s Pastries Plus. Mike and Judy — who both still live in Chelsea — run the shop day to day, while Steve maintains his day job as an IT manager. Ellie's Chelsea co-owner Steve Radant talks with regular Len McDougall, former Chelsea chief of police, while he is on break from patrol duty. Tue, Jan 3, 2012 : 2:18 p.m. The grinders are very good. Hope they do well.